Your penny is one of the dates likely found in a box of old coins and 1902 Indian head penny value begins in the $1 to $2 range. However, because of strong collector demand it is becoming a valuable collectible. 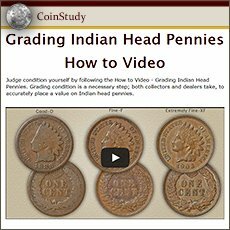 Have a look at the value charts then compare your 1902 penny with the condition "grading" images below to find accurately how much your Indian penny is worth. In the hobby these old pennies are some of the most sought after. Some of the rarest and seldom encountered are what’s known as "uncirculated" pennies. They were never used. 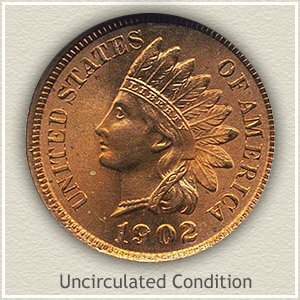 Pictured is an uncirculated 1902 Indian penny, one of just a few in this elite condition and worth well over $200 to an avid collector assembling a gem quality collection. Only through a close examination of your coin, by comparing it side by side to the grading examples allows the discovery of its true value potential. Small differences, for example, the ribbon crossing her, if well defined with the center diamonds visible confirms a better condition and higher value. Unlikely to happen and very rare, but there it is, a 1902 Indian penny still in the original condition it left the mint. Bright gold and red copper, lustrous and complete on both obverse and reverse. Further more, the coin was protected from contact with other pennies leaving the surfaces free of any significant marks. Noticed by many collectors when offered at a David Lawrence rare coin auction, their bids took the value of this gem 1902 penny to $506. An elite condition example of an Indian penny worthy of an elite collection. Continued popularity and value of the series extends to circulated coins as well. Wholesome lightly worn coins with pleasing surfaces are important parts of many Indian penny collections. Your coin is always in demand to fill this need. Judging a coin’s state of preservation is known as "grading" by dealers and collectors. How well your 1902 penny survived and the amount of overall wear determines value. Easily recognizable features are highlighted with images and descriptions to help classify the different degrees of wear. 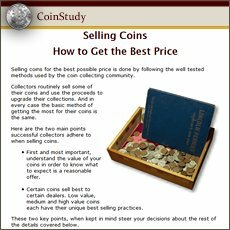 Comparing your coin gives its grade. 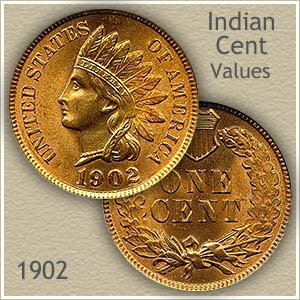 Uncirculated: High in demand and 1902 Indian head penny value are coins that never circulated. Amazingly there are a select few known with the original bright mint luster radiating across the surface. Confirm your coin is "uncirculated" by examining the very highest points of design. The ends of the feathers and her cheek are two areas that would quickly appear dull and slightly smooth from the lightest of wear. Rotate the coin under a light, wear shows as a disruption in the luster as it travels around the coin. Extremely Fine: Crisp and sharp defines the "extremely fine" grade. You have to look close to find the small amount of wear present on the hair just above the ear. Notice a slight flattening to the cheek below her eye, and the ribbon trailing below her headdress. Overall a nice coin with a pleasing appearance. Fine: Highest parts of the design, cheek, neckline and headband are visibly worn, and somewhat flat. 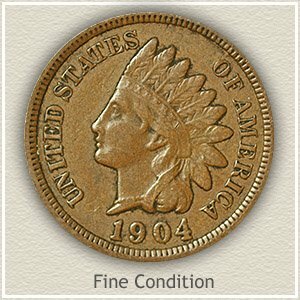 However, all major details remain clear, indicating a 1902 Indian penny in "fine" condition. Normal roundness of her cheek and chin has worn away. Along the back of her neck most fine details separating the hair curls are now blended into one. It is important the central area of the headdress is well defined with nice definition, headband and all feathers separated. In total, a bold moderately worn coin remains. Good: Extensive use has worn the majority of this coin away. Most detail separating the feathers, headband, and hairline above her face is smooth and missing. Collectors and dealers prefer a full rim if considering a coin as reaching the "good" grade. 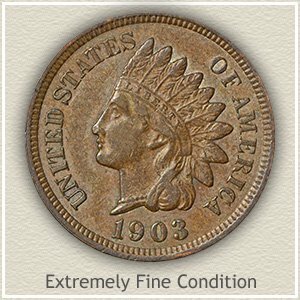 Rest assured, your 1902 Indian head penny value is supported by the series popularity.